In this episode, Rose tells her that time has been bending around her, because she is important – a point in time where everything changes. While some may argue that her contribution could have been an accident – it really couldn’t have been. It had to be Donna because she is who she is. She is brash, she is clever in a different manner than anyone else in the reboot and she has a clear sense of right and wrong that saved the Doctor – and others – more than once during her tenure as Companion. It couldn’t have been Rose who touched the hand and precipitated the metacrisis that resulted in the creation of the second Doctor – the half human doctor – for obvious reasons. It couldn’t have been Sarah Jane, or Martha or even Jack because the Daleks recognized each of them as threats – maybe not as large a threat as the Doctor himself, but enough that “the Children of Time” are brought to the crucible to witness the culmination of their nefarious plan. But they don’t really care about Donna, they dismiss her when she’s locked in the TARDIS because they have no idea she could be as great a threat as the others who have proven to be warriors in their own right. And while the others had destruction on their minds, Donna didn’t. When she’s zapped and the Doctor’s mind becomes active in her own, her aim wasn’t to destroy the Daleks, in fact she merely rendered them harmless and set about cleaning up the mess they had made by sending the missing planes home. There was just a problem that needed to be fixed. Donna was practical and straight forward in a way that the Doctor could never be because his head is too full of the universe, full of time, and full of past hurts. The others all had survival on their minds, all of them had learned how to fight, but not Donna. She’d been fighting all her life to be anything other than a temp from Chiswick. But the moment that gets me every time I watch this episode is when she first meets the second doctor and she asks again why time is bending around her, why she is so important and he says quite simply “Cos you’re special.” as though it’s the most obvious thing in the world. She protests and then it dawns on him – because he’s never thought it could be any different – that she doesn’t believe that about herself at all. I think in that moment we’re all Donna. We all want to be part of something bigger, better than the menial nine to five and the fact that someone like the Doctor, who is arguably the most unique creature in the galaxy thinks she’s special just the way she is, is a mind blowing idea. You can see it in her expression, even though the moment’s fleeting, and the Doctor continues off on another of his tangents because it’s suddenly clear to him how events were unfolding from the start – that it affects her hugely. The Doctor tells all his companions that they’re brilliant, but it’s not just a compliment. He really believes it of each of them for different reasons – and the same one at the same time. They’re human and he’s not. And even when her mind is full of the Doctor’s memories and she’s smarter (“you can’t even change a plug!“) and wreaking havoc on the Daleks it’s the Donna part of her he cherishes most. Donna begs him not to take her back to her ordinary life, to let her continue to be DoctorDonna, but he has to save her. For him, for her parents, and ultimately, for her. He takes her memories of him, and all her accomplishments in order to save her life. It weighs on him, but it’s the right thing for him to do – because she saved him from going too far on more than one occasion and he will never forget that. There is only one thing he can give her: her life, however ordinary. And while he’s explaining to her mom and granddad what happened and reminding them how special she is to him, he takes care to remind them of how important she is to them (and to remind her, too) as well as the entire universe. The Doctor is like the ultimate cheer leader, rooting for his human companions while they struggle in a vast and unknowable universe that’s sometimes right in their own minds. I cried through the whole last part of this episode because Rose finally gets what she wants – the Doctor, or the human version of him with only one heart (how can he have two hearts in that skinny chest of his? Are Time Lords like their technology? Bigger on the inside? Certainly is that way with his mind, that’s for sure.) . They get to grow old together after all her efforts to get back to him through time and alternate dimensions in spite of arguably impossible odds. Because Martha and Jack and Mickey head off into the sunset to accomplish something new and interesting: “You know, I’m not sure about UNIT these days. 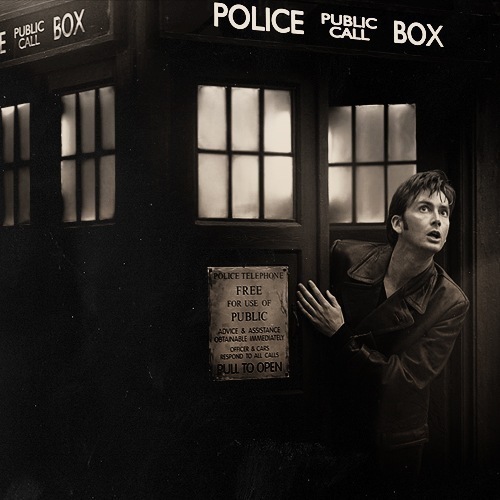 Maybe there’s something else you could be doing.” and because the Doctor is alone once again. At the end, Donna doesn’t remember him and so he doesn’t get to hear her say goodbye. That scene where she dismisses him to talk into her phone is heartbreaking. It’s Donna’s grandfather who is the only one to ask about him, if he’ll be alright and we have to wonder as the episode ends with him all rained on and alone in the TARDIS. He’s alone again, as he has been so many times in his long, long life and we can see that it hurts him as much as it did the first time. Wilf’s speech about looking up at the stars every night and remembering for Donna hits me right in the feels, as the tumblr-verse says, very time. That’s nerd-speak for “turning into a sobbing mess”.